How can I identify my IH V8 engine? Check on the right side of the engine towards the front, on the side of the block there is flat spot about the size of a domino, just below the cylinder head and exhaust manifold. 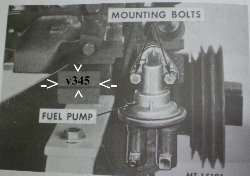 The engine size is stamped in this location. There were approximately 4,000 total SSIIs produced from 1977-1979. SSII *sales* figures (not production figures) are as follows: 1977 = 783, 1978 = 2478, 1979 = 491, 1980 = 176, 1981 = 34, 1982 = 6. When was the Last Scout built? The last Scout II rolled off of the assembly line October21, 1980. What does XLC mean? The XLC abbreviation on early and mid year Scout IIs designates Extra Load Capacity. When was the Traveler and Terra introduced? 1976 was the introductory model year for the 118" wheel base Traveler and the 118" wheel base Terra models. Travelall and Pickup models: Starting with the L-series in 1950, the 1/2 ton models were designated as the 110, 3/4 ton as the 120, 1 ton as the 130, 1 1/4 ton as the 140, and 1 1/2 ton as the 150 (the GVW of the 150 reached into the 15,000# range, which bears little relationship to the "1 1/2 ton" designation sometimes used. The next heavier model was the 160, which evolved into the 1600 series Loadstar). This numbering applied to the '50-52 L-line, the 53-54 R-line, the 55-56 S-line, then in 1957 the Golden Anniversary models restarted the lettering with the A-110 (thru A-150) models for 57-58, the B-110 models for 59-60, and the C-110 models for 61-62. '61 saw the addition of a C-100 as another 1/2 ton model with the torsion bar independent front suspension rather than the I-beam of the C-110 which continued to be available. The 110 was not a heavier version of the 100 as the numbering might suggest;the two front axles had the same weight capacity and everything else was the same. There were no 100 (or 1000) 4x4 models. The 140 series disappeared around 1960, with the 130 and 150 models covering the range. A "major" change in the numbering scheme occurred with the 63-64 models when all model designations were multiplied by ten along with a restyling; the C-100 became the C-1000, with the other models becoming the C-1100, 1200, and 1500. In '65, the models became the D-1000 thru 1500. For '66, the letter designation was moved to the end and restarted at A; the D-1000 became the 1000A, followed by the 1000B in '67, the 1000C in '68, and the restyled 1000D in 69 and 70. In 1971, the letters were dropped and the models became the 1010, 1110, 1210, 1310, and 1510. No model number distinction was made between the 71, 72, and 73 models; they were all 1010's, etc., although I do recall the description 1010A being occasionally used in '71. One odd-ball model was available from '63 through '67--a 900 model. 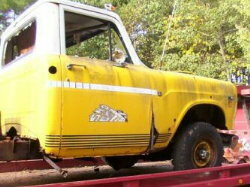 Starting as the C-900, this was a stripped-down pickup with the 4-152 engine, 3 speed trans, and a 6 foot step-side box. By 1967, it had developed into the 908B with the V-266 engine and a 6'8" box in either a step-side or bonus-load style, but it was still a low-end, price-leader model. Another variation seen prior to '63 has the basic 110 or 120 model designation upgraded to 111 or 112 for optional GVW ranges of the model. The logo on the truck was not changed, but the paperwork would label it accordingly. In 1974, the vehicles were again redesigned with coil-spring independent front suspension for the 1/2 and 3/4 ton 4x2 models, now designated the 100 and 200 series. The 1510 became the 500 series, but did not get IFS. There was no 1 ton 300 series, but the 200 series had the optional axles and springs from the 1310 to cover the weight range. In 1975, the 100 series became the 150 series with a minimum GVW of 6200 pounds so that it was not necessary to meet stricter light-duty emissions laws which applied to vehicles with GVW's of less than 6200 pounds (the same reason the Scout was designated Scout XLC--Xtra Load Capacity with a 6200 GVW in 1975). Other than suspensions, no major changes were made in the trucks. Canada Built Scouts? Light Trucks?? When did International Harvester start building Scouts? In the late 1950s IH began a design plan to produce a vehicle to compete with the Jeep CJ. 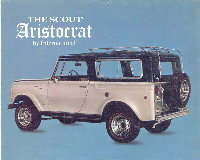 By late 1960 the first Scout was available. 1961 was the first model year. International has been building Trucks, Pickups and later Travelalls since 1907. 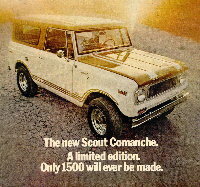 The Scout 80 was the designation for the Scout models. program. We were off and running. Goodyear produced many plastic parts for WWII and had formed a large plastic engineering group. We entered a program with them, a scale model was vacuum formed to simulate body assembly. this model received excutive approval for appearance. By July 1959, Goodyear completed thier costing and, because of the high costs, the plastic program was cancelled. By this time the contoured design met with excutive approval and a descision was made to convert the body design to steel. Starting in late July 1959 a full size clay model was completed and, in November 1959, it was approved. Looking back, it was a remarkable program with fast paced engineering and manufacturing developments. the total development time of 24 months was a heroic achievement considering the concept was unique and no in-house engine or manufacturing was available or even considered when the program started. The first Scout was introduced in 1960. A concept for its replacement was initiated in 1964 and approved for produsction in mid 1965. 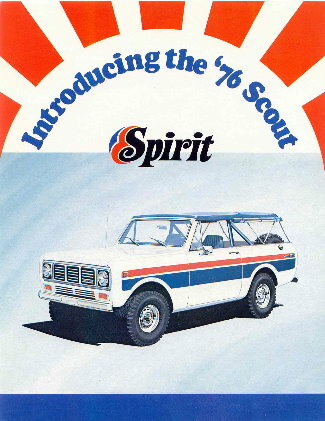 The Scout II was introduced in 1971. The basic sheet metal remained the unchanged until production stopped in October 1980. During the 20 year period (1960-1980) 532,674 Scouts were produced. The Scout, introduced as a commercial utlity pickup in 1960, set the stage for future 4 wheel recreational vehicles of the 70s, 80s, and 90s. Click here to view The Ted Ornas Interviews! What is the difference between models: Scout 80 and Scout 800? Scout 80s were built between 1961 to 1965. These models were identifiable by sliding windows (1961), 152 4 cyl. engine, a fold-down windshield, vacuum windshield wipers at the top of the windshield and an IH logo in the center of the grill.The Scout 800 was built in late 1965 to 1971. These models were built with more improvements in comfort and design and had fixed windshield frame, bucket seats, windshield wipers at the bottom of the windshield, an optional 196 4-cyl., 232 6cyl, 266 V-8, & 304 V-8 from 1969 to 1971. International nameplate replaced the IH logo on the grill. Letter A & B were added to the last year models: Scout 800A 1969-1970 & Scout 800B 1970-1971. How Do I tell the differences between Scout II year models? Scout II's were manufactured from mid year 1971 to 1980. 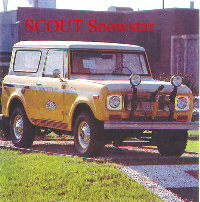 The Scout II, Terra and Traveler were produced from 1976-1980. 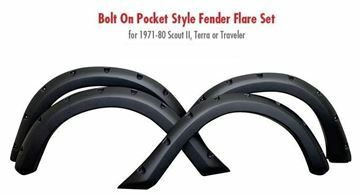 Terra's and Travelers had fiberglass tops: half top for the Terra or full top with hatchback type liftgate on the Traveler. SSII or Super Scout II was built from 1977 to 1979 in order to compete with the Jeep CJ. 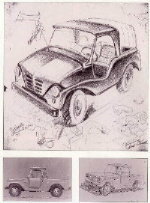 This model included a soft top with soft doors, Jeep style mirrors, plastic door inserts, special plastic grille and a roll bar, among other options. Several SSIIs were champions on the off-road racing circuit during the late 70s! 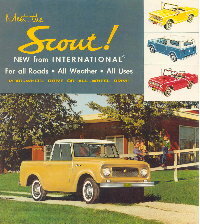 The Scout II is most identifiable by its different front grills. The 1971 - '72 Scout II shared the same grill, three horizontal bars between the headlights and chrome rings around the headlights.1973 Scout II's had 14 vertical bars between the headlights, a split in the middle, seven bars on each side surrounded by chrome trim pieces and an International model plate low on the left side.1974 - '75, Scout II grills were the same as 1973, with the addition of a vertical bar trim overlay. The 1975 had chrome & black square trim rings around the headlights.1976 had the same headlight trim rings as 1975, a chrome center grill of 15 horizontal bars split into three sections was used in this year only. 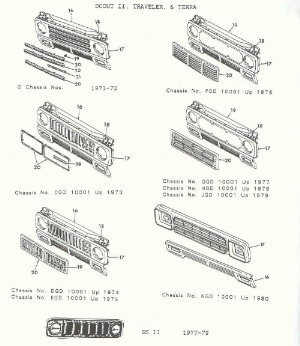 1977- 79 Scout II's used the same grille between the same headlight bezels the new chrome grill had two large horizontal bars with three vertical support lines and the International nameplate moved up to the center of the grill on the left side.1980 the final year of production for the Scout, it had a very distinctive grill design available with black or silver, a one piece grill with square headlights, made of hard plastic, both grill color options had imprinted chrome trim around the headlights and on international name located on the left side. What engines were available in Scouts models? International offered a variety of engines:Scout 80 800 A B:1961 - 65 had standard: gasoline powered engine 152 4-cyl. From 1965 to 71 had options of these gasoline powered 196 4-cyl., 232 6-cylinder, 266 V-8, 304 V-8. There was a brief option for the 4 cylinder of a turbocharger in 1965. The Scout II made between 1971 and 1980 had engine options like: 196 4-cylinder., (Early) 232 6-cylinder, 258 6-cylinder, 304 V-8, 345 V-8, SD-33 Diesel (non-turbo), SD-33T Diesel (Turbocharged) engine. 392 V-8s were never installed in any Scouts from the factory. 1976 was the first year for a diesel powered vehicle to be available in the US, it was in the Scout II! IH used the Nissan SD-33 diesel engine for fuel economy. 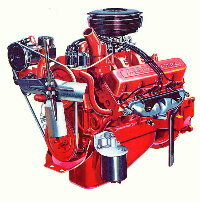 In 1980 IH SD-33 was replaced with the SD-33T (Turbocharged) diesel engine. These Diesel Scouts were great for economy, getting 20 mpg in the city and up to 30 mpg on the highway. All gasoline engines offered were made by IH including the v304 which is sometimes confused with the AMC 304, except for the AMC 232 6-cylinder, 258 6-cylinder. The full sized IH Pickups and Travelalls used an AMC v401 as an option when there was a shortage of IH v392s in 1973-74. How many Diesel Engines were used Scout IIs? How can I tell what axles are under my Scout? Dana 27 & 30 were used in Scout 80 800 A B. Each axle cover should have a tag to ID the Axle, if not the Lineticket can be checked to ID the axle and ratio.In Scout IIs until 1974 Dana 30 front axles and Dana 44 rear axles were standard. Dana 44 front axles special order in 1974. After 1974 Dana 44 axles became standard on all Scout IIs.To tell the difference on Scout IIs you can compare axle covers. If they look the same, front to rear, they should both be Dana 44's. If the front cover is a smaller and is more rounded cover, it is should be a Dana 30. The Vehicles Lineticket can also be used to ID the axle, ratio or if the vehicle is equipped with a posi (Trac-loc) rear end or open carrier. What gear ratios were available in Scout II's? 2:72, 3:07, 3:31, 3:54, 3:73 and 4:09 ratios. What year Scout II had disc brakes? Late 1974 Scout IIs and later had disc and power brakes as standard from the factory. Early 1974s had Disc brakes as an option only and they were rare. What was the Shawnee Scout? The Shawnee Scout (SSII) was to be a trim type and special feature package model produced by The Hurst Corporation, all black SSII with special Tomahawk and feather decals, special seats, with a black targa style top, hard tonneau bed cover and of course a Hurst shifter. There were only three or four of these ever produced. What does CVI mean? 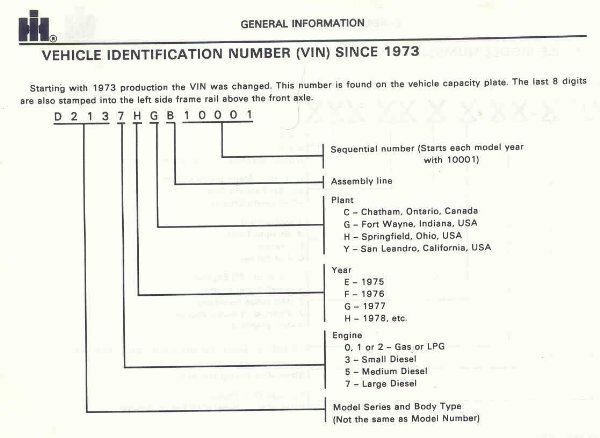 CVI - Custom Vehicles Incorporated (also associated with Good Times Inc.) was a company located around the corner from the Ft Wayne Scout Assembly Plant that produced for IH Dealers special models in 1979 - 80. These were dressed up Scout models with special exterior decals and trim, center console coolers, hood scoops, some editions had plastic window louvers on the rear side glass, fender flares, and two different plastic tailgates insert. Model names included: Midnitestar, Terrastar, Travelstar, Shadow, Raven, 2 Classic models, GMS (Green Machine Sport), Hot Stuff, Trailstar, Sportstar, 5.6 Liter & 3.2 Liter models. What was the "Selective Edition" Scout II? This was a Special package available from the factory. 1978-79 Package order code on the Lineticket was 10992, the package included special gold accent stripes, gold spoke wheels with Goodyear Tracker A-Ts, SSII black grill insert, Sport Steering wheel. Other options available: Choice of Power train, Seats, Interior, Radios, Cruise control, Tow packages, AC, available in exterior colors 1032 Dark Brown, 6027 Dark Blue, 001 Black, 5013 Green. Available on Travel top, Traveler and Terra. 10876 for the side applique. 18696 to omit the hard top. 9219 Winter white exterior paint.  925102 10-15 Rear tires with spare. 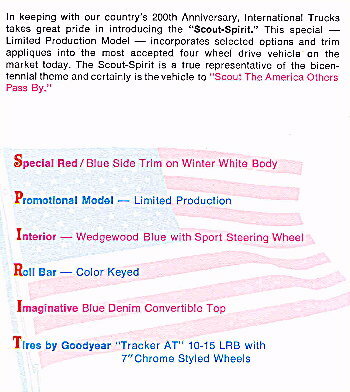 The Patriot had a hard top and the same blue/red side applique and was available in a Scout II, Terra or Traveler. Sales figures on the Patriot only show 1 Terra, 7 Travelers, and 50+ Scout IIs were manufactured. However there was another undetermined number of patriots built without Lineticket code designations and the applique was applied at the TSPC (Truck Sales Processing Center) making difficult to know just how many were actually built. IH Data only shows 384 Spirit models ever being built making both models extremely rare! What is the "Midas Edition" Scout II? 1977- 80 IH contracted with Midas Van Conversion Co. of Elkhart IN., to build special luxury models to offered through its dealers. These vehicles had swivel bucket seats, shag carpeted, color keyed interiors, door panels, headliner, sunroofs, grille guards, dual sunroofs, overhead clocks, 3rd seat, reading lights, tinted windows, fender flares and special side appliques and paint designs. Models included the Family Cruiser or just: Cruisers, Street Machine, and Off-Road Vehicle. These vehicles had swivel bucket seats, shag carpet interiors, sunroofs and flashy side appliques and paint designs. Another Company Called Van American (Goshen IN.) offered similar options to compete with Midas, however these vehicles were only offered for a short time making them very rare today. What was the last special package for Scout II offered through IH? Probably one the rarest models ever produced by IH was the 1980 RS, the Special Limited Edition RS Scout. This package was only available on the Traveler in Tahitian Red with special extras inside and out, including polycast wheels with Tahitian red accent, luxurious plush all-velour russet interior including headliner and visors, special pin striping, wood grain trim instrument panel and shift console, chrome bumpers, tinted glass plus more. 2 other special packages offered in 1980 were the 844 and 434 Gold Star Models. 844 offered standard equipment plus v8 345 HD clutch, T428 4 speed transmission, 2:72 rear axle ratio, am radio, rear seat, hub caps, special black side applique and paint on lower body, & black carpet. 434 offered standard equipment plus 4-196 engine, T332 3 speed transmission, 3:73 rear Axle Ratio, Black vinyl interior. am radio, rear seat, hub caps, special black side applique and paint on lower body, & black carpet. Were there any special Packages offered on the Scout 80 800 A B? 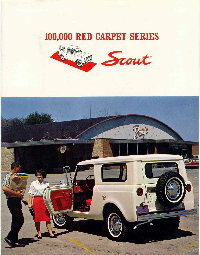 The first was the Red Carpet Series, celebrating the first 100,000 Scout manufactured by IH. This model had a red interior with a white exterior, full length headliner, a personalized medallion with the words inscribed: "100,000 Red Carpet Series Scout By International" affixed to the door. 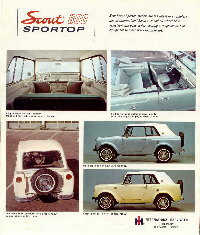 IH offered the Sportop edition Scout 800, which had a slanted sporty type canvas or fiberglass top. 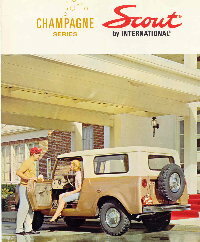 The Champagne edition was a "dolled up" Scout 800. Later the Scout 800 A & B came out with the Aristocrat, SR-2, Commanche, and Sno-Star models. Each of these Scout packages had their own special paint and decals with many options making them special and above normal models. Where there ever any Special Packages offered on Pickups? 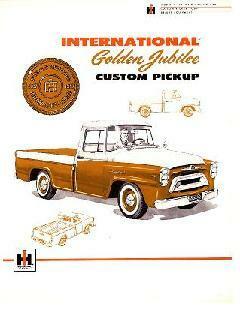 There are only 3 known: First, The Golden Jubolee Pickup which celebrated 50 years of International Trucks in 1957. 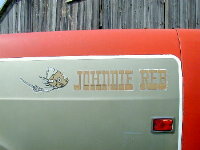 The second was The Johnnie Reb, a Pickup built in 1971 for the Southern States The third was a Snowstar Pickup which is listed in the parts books however we have never come across one in person but have found a photo of a rough snowstar pickup recently. special pickup became available, just as the Cameo was produced by Chevrolet with all the trimmings. 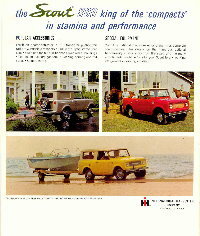 The Jubilee was a basic IH pickup with a special pickup box. The box was of the Cameo type with sides flush with the cab lines rather than the standard stepside type of box that has regained popularity on today's pickups. This truck sported a special gold and white paint scheme, accented with chrome trim, bumpers and grille. White wall tires Dual mirrors, custom gold nylon seat covers, with color keyed padded door panels, sun visors and arm rests were added to this luxurious package. 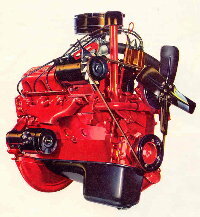 The engine choices were of 3 six-cylinder engines from the BD-220 up to the BD-264 for which IH claimed had V8 performance with six-cylinder economy. Optional power steering, automatic 3 speed transmission and power brakes made the Golden Jubilee retain its truck heritage while offering passenger car performance and handling. What is a Lineticket? 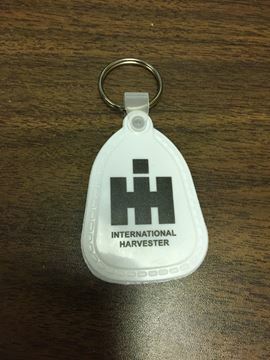 When an IH Vehicle was ordered, a Factory build or construction sheet is created (when order is sent to the factory) with the new vehicles Vin or ID number, all the codes for standard equipment and options the salesman used to create this vehicle for his customer or inventory. This sheet is used to assemble the vehicle from beginning to finish. After the factory assembles the vehicle and the vehicle is shipped and sold, the Lineticket identifies such things as the engine type, transmission type, drive line, paint codes, gear ratio, and standard and optional equipment, specific to that vehicle. 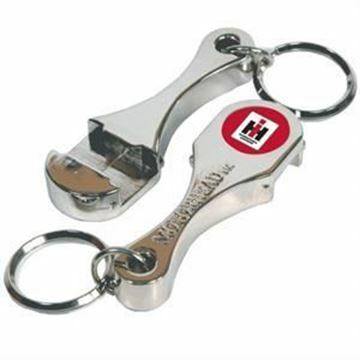 This was and still is a very valuable tool when ordering parts later at the dealership by the customer. A very small copy of the Lineticket was attached to each vehicle in different places during the building process at the factory. 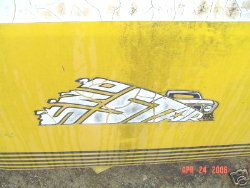 1971 - '76 Scout II's had its copy of the Lineticket under the vehicles hood attached to the cowl cover panel. 1977- '80 Scout II's had its copies on the inside of the glove box door.